Following a rocky 0-2 start to the season by the Seattle Seahawks, any talk of them even being a contender for the playoffs was dismissed out of hand, but following a very convincing win in London against the Oakland Raiders, there’s now an air of “could they?” floating around. They have only had one loss in the last 4 games which came at the hands of the 6-0 Los Angeles Rams; managing to hold them to a close scoring game. Whilst the odds may still be stacked against them, there are certainly a number of reasons why you should not write this team off just yet. Without a shadow of a doubt, the area holding this team back the most previously was the offensive line. Once ranked the worst in the league and leading the way with penalties, it has looked like an entirely different group of players under the direction of new offensive line coach Mike Solari. Germain Ifedi seems to have benefited significantly under his tutelage, seeming more settled on the offensive line and penalties on him have been few and far between this season. The additions of D.J Fluker and J.R Sweezy have not only anchored this group but breathed a new air of ruthlessness into it. With the offensive line now ranking first in the league for pass blocking efficiency according to PFF, Russell Wilson has been able to show more of his skill set than just his ability to scramble outside of the pocket. He looks more at ease in the last few games and confident now he has a cleaner pocket to work within, producing a passer rating of 114.9 in the pocket, ranking him 7th in the league. This has meant seeing more variety in Seattle’s plays with play actions and deep throws now being balanced against the run game. The improvements in the offensive line and Russell Wilson have also played a large part in the Seahawks being able to have a run game again. 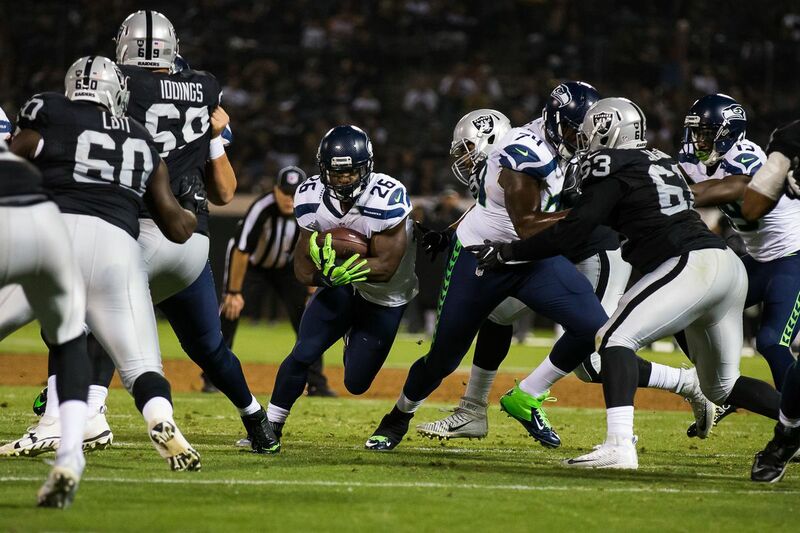 Carroll had emphasised this as the main priority this season and running backs Chris Carson and Mike Davis have certainly come up with the goods. Between the two of them they have put up 545 rushing yards and 3 touchdowns in 6 games. They both have a similar aggressive, powerful running style that Seattle has not seen since the days of legendary running back Marshawn Lynch. After a promising preseason and a number of limited carries in weeks 1-2, it wasn’t until week 3 that Chris Carson was able to show his full potential. He had his first 100+ yards within a game, rushing for 102 yards and scoring his first touchdown of the season. Mike Davis had to wait until week 4 against the Cardinals when Chris Carson was injured to see any significant number of carries but he quickly showed in this game why “no-one should be sleeping on” him. He rushed 21 times in this game for 101 yards and 2 touchdowns. Suddenly the Seahawks found themselves with the dilemma not of how to get the run game going, but of how they were going to divide the carries to running backs after a fairly long drought period at the position. Currently able to savour their 27-3 victory in London against the Raiders for another week due to the bye, the Seahawks will be keen to keep this progress moving forward in week 8 as they hit the road to take on the Detroit Lions at Ford Field. Whilst the Lions are sitting at the bottom of the NFC North at 2-3, the Seahawks have won three out of their four last games. Coming off of the bye week well rested and providing they are mindful of the lessons they have learnt so far, there is no reason to believe that the Seahawks cannot continue to build on their success and progress to another victory next week.